E. Ross Allen was a genuine Florida character. Born in 1908 in Pittsburgh, Pa., Ross gravitated toward the wilds of nature, and where could you find nature in greater abundance than Florida's Silver Springs? As a boy he made Eagle Scout, and would later help the Boy Scouts set the standards for several wildlife merit badges. He was stand-in for Johnny Weismuller in the Tarzan movies shot at the springs, then went on to star in a few short films of his own that depicted him as a sort of latter day Tarzan -- an image he was careful to cultivate. Marjorie Kinnian Rawlings, in her account of a snake hunt with Ross in Cross Creek, paints him as an easy going, patient man, with a great love for the wilds and understanding of its creatures, especially snakes. Characteristically, he had invited her on the hunt in hopes that she would write about him. 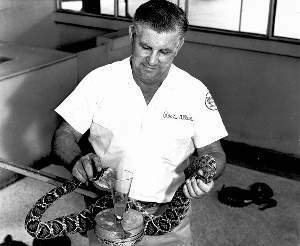 He founded Ross Allen's Reptile Institute at Silver Springs in 1929, displaying native snakes, alligators, and an "Indian Village" with Seminoles he recruited from the Everglades. After watching Ross handle the snakes and Indians wrestle gators, tourists could purchase their own souvenir live reptiles to take back home with them. As time went on the emphasis at the Reptile Institute shifted a bit, from wild and woolly demonstration to scientific observation. Allen's studies of the American Alligator were among the first of this important reptile. Snakes were milked for their venom to be sent around the world for research and the production of antivenin. (Antivenin Ross would himself need on occasion, having been bitten more than a dozen times in the process). Reptiles raised here were sold to zoos and other tourist attractions across the country. Silver Springs saw a sharp drop in visitors in the 1970's after the opening of Walt Disney World and the gas crisis, and as the main Silver Springs attraction began to consolidate itself the peripheral attractions, like Tommy Bartlett's Deer Ranch, the Prince of Peace Memorial, and the Reptile Institute closed or were absorbed into the single Silver Springs park. For a time, Ross continued to give reptile demonstrations at the Alligator Farm in Saint Augustine, and he lent his name to a small wildlife park adjacent to the Shell Factory in North Fort Myers. Then, he developed bigger plans. Ross Allen's Alligator Town was to be a tourist attraction and alligator farm in Lake City near the intersection of I-75 and U.S.90. Rather than fight Disney, Ross hoped to siphon off some of its southbound traffic on the way. The 50 acre, $800,000 park was to feature a reptile museum, alligator farm with underwater alligator wrestling, a rattlesnake show, turtle garden, and wild lizard jungle. Waterslides, rides, and other theme park trappings were to be added eventually, with an amphitheater for concerts and other shows. Allen, along with partner Dennis Magee, a former president of the Florida Herpetological Society, planned a June 1981 opening. But it was an opening Ross Allen would never see. The month before the park was to open he became ill, then died in Gainesville's Shands Hospital on Sunday, May 17, 1981. He was 73. Alligator Town did eventually open, but it wasn't the success predicted by Allen. One of the building contractors ended up owning and running the alligator farm as pretty much a one man operation. In 2002, when the Florida Sports Hall of Fame down the street closed Alligator Town was still open, but just barely, only a shell of what it once was and could have become. Shortly thereafter it closed forever and the reptiles were removed. The main entrance building has since been a construction office and even a fight club, and, as of October, 2010, was listed for sale. As for The Florida Sports Hall of Fame, it was eventually able to reopen in 2010 in a new facility in Auburndale. The old building on Hall of Fame Drive in Lake City now houses a branch of the Columbia County Library System. Return To Florida's Lost Tourist Attractions, a site celebrating the now defunct tourist attractions of the Sunshine State. The attraction profiled on this page no longer exists. Photo of Ross Allen courtesy of the Florida State Archives Photographic Collection.